At this point in the boxing match between Becca and Becky things got weird. Becca knew that she had knocked Becky senseless and basically threw the boxing rule book out the window! She wrapped the tall brunette's long hair in her boxing gloves and yanked her roughly to her feet and dragged her over to the ropes. Becca wrapped the girl's hair around the ropes and trapped her there as she slammed punch after punch into the poor beauty's face! We wanted to step in but our policy is to let the fights play out (yeah, it's more fun that way!) so we let the camera capture the action as Becca destroyed poor Becky! 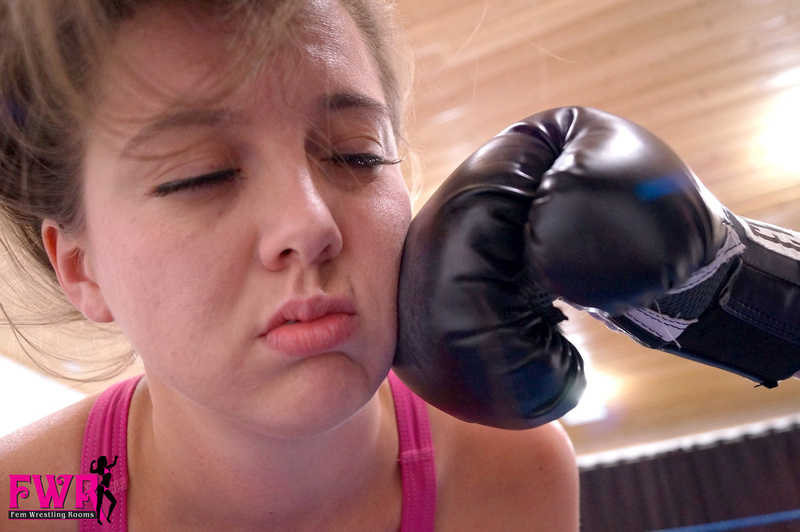 The brunette's arms hung limp as her face was pummeled by the blond boxer. Becca finally dragged the groggy beauty over to the corner and lifted her up so that she was laying across the top ropes and that her body was stretched out to present an amazing belly punching target! The blond held Becky in place with her hair and threw punch after punch into her exposed belly. Becky grunted as the air was forced from her lungs by Becca's hard punches. Finally, Becca brought her adversary down from the corner and watched as Becky collapsed to the mat. A quick roll brought Becky to her back and our blond boxer mounted her to administer more pain! Grabbing another handful (or should we say "glove full") of Becky's long hair, Becca pulled her up into several huge punches to the face! Becky winced with pain but was pretty much out of it at this point. Using that amazing long hair of her opponent, Becca yanked her to her feet one last time for the final knockout punch. Sweet Becky was nearly out on her feet as Becca kept her in a standing position by holding her up by the hair. Then she threw the final knockout punch …. A huge hook caught poor Becky square in the jaw, causing her to spin around uncontrollably, her body a pure rag doll! We could tell that she was unconscious before she collapsed to the mat and only hoped that she would survive to see more fights against our blond bombshell, Becca! Although we don't condone cheating here at FWR, we do like to see a creative fight and Becca definitely delivered! And we really LOVE seeing her spectacular victory poses! !